One of bottle collecting’s most prominent and well-liked members died October 3 from heart and kidney complications, Stephen “Peck” Markota was a mainstay of the hobby and good friend to everyone. He was 76. Peck, as we all called him, was a man who not only loved collecting bottles and other assorted things, he also was a man who spent much of his adult life spreading the word and working to further his fascination and love for antique bottles. He and his wonderful wife, Audie, wrote the definitive book on western soda bottles and then another on California Hutchinson bottles. He started the first bottle show in the Sacramento area in Folsom on June 14, 1969. This set the stage for others who would follow and begin setting up their own shows throughout the state. Among his many achievements, he was elected the Federation of Historic Bottle Collectors second vice chairman of the first FOHBC board of directors at the 1969 meeting in Berkeley. He was also elected 1st vice chairman of FOHBC at the convention in Denver in 1969. A member of 11 different bottle clubs, a tireless bottle exhibitor and author, his enthusiasm for the hobby never waned. As well known bottle guru Bill Baab wrote in 2006, “In nearly every club, there is a nucleus of a few members who do all the work needed to keep it going, while the rest of the membership are content to do nothing. Meet Peck Markota, one of the workhorses of the Federation.” Peck was eventually elected to the FOHBC Hall of Fame in 1993 and was the Federation’s first Honorary Director. As many have said, it was Peck who was the true spark behind the Federation being founded. Most of all, it was Peck the nice guy. Peck, who would talk about his kids, grandchildren and great grandchildren as if they were angels, sent to earth. He never had a bad word to say about anyone and that’s the truth. When someone passes on, we hear the most wonderful things about them regardless of whom they were. I can assure you that everything people will say about Peck from here on is the truth. When I started my antique bottle auctions, I wasn’t exactly welcomed with open arms. The first National show I went to I felt quite awkward and a little out of place. Who came up to me and introduced me to the mainstays of the hobby? You guessed it. Peck judged people by who they were not what he’d heard. If somebody had something bad to say about someone else, Peck would just as soon walk away and start a discussion with another friend. He was opinionated but his wonderful smile and generous demeanor were only stoking a friendly fire. He wanted so badly to share his passion and love of the hobby, he literally spent much of his life doing just that. Goodbye, old friend, I still say your name almost every day as I write my bottle descriptions and talk about sodas. A day before he died I was doing the soda section of our upcoming auction and like every auction, without Peck and Audie’s book, I’d be lost. Markota this, Markota that, his quest for knowledge never stopped, thank goodness. His legacy will live on; it’s in so many of us who were lucky enough to know him. He never stopped giving and now we’ll never stop remembering him. Peck Markota, a great man and bottle pioneer. The hobby wouldn’t be the same without you and that my friend will be true forever. Goodbye. I am sorry to read of Peck’s passing. He and Audie were always a joy to talk with and to share bottle stories. 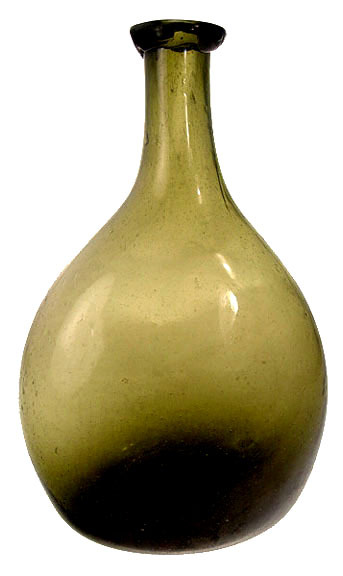 Yes, Peck was there as was Cecil Munsey (of Poway,CA) and others of the early well known West Coast bottle collectors. Thanks for bringing us up to speed Lois. There’s a lot of history here that needs to be re-told. Years from now it would be nice for people to know who really began and established this wonderful hobby. Jeff: Love your website’s new look. 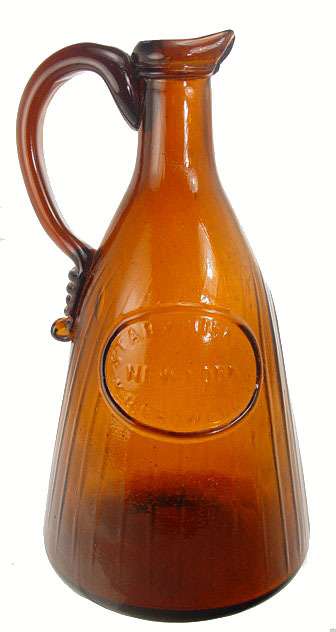 Great array of Hanbury Smith bottles in all colors. Wonderful tribute to Peck. I know Audie will be pleased. You, too, with your enthusiasm and expertise, are doing a great job in spreading the word about our wonderful hobby. Thanks so much. Now I need to go take a nap. I’ll never forget meeting Peck and Audie Markota for the first time up at the Auburn Bottle Show in 2005. I knew I was meeting two of the living legends in the bottle world! After all, I had spent countless hours during my high school and college days pouring over the pages of their remarkable Western Soda books. I was so happy to meet this humble, friendly, and inspiring couple! I was also thrilled to buy their new 2005 edition of “Western Blob Top Soda and Mineral Water Bottles.” And of course, I had them sign my book and asked them some questions I had about all these Western soda bottles I was trying to collect. I kind of figured it was the least I could do to show my appreciation for their combined countless hours of research, hard work, and most of all….their PASSION for the future of the hobby! I am still befuddled where one would even begin to compile those kinds of books. They were really able to capture that same kind of pioneering spirit we all admire about the Old West. Over the course of the next few years, I would always look forward to seeing Peck and Audie at the bottle shows, all-the-while picturing myself years down the road getting to pass on the torch of this unique hobby to the next generation of diggers and collectors! The passing of a man like Peck leaves a huge void in a hobby like ours. It is both challenging and inspiring to try and walk in the footsteps of such a great contributor to life and to this hobby. Peck Markota has left behind his own stamp and signature that is indeed “Hall of Fame” material, through and through! Jeff, what a class job you have done with your auctions and website! Great tribute to Peck Markota as he/his book on Western Sodas got me very excited about collecting once I found the first Gold Rush soda bottle (Lynde & Putnam) on the construction site of the San Francisco’s TransAmerica Pyramid way back in high school (early 1970s). His great research and listing of all the Western glob top sodas led me on “the hunt”… years later my collection is now in the thousands of bottles, and I have since built the largest collection of Art Deco inspired soda pop bottles in the USA (credit to Brian Wade as well for writing his excellent book on them – he beat me to the punch and rightfully so being located back east and privy to so much more of those bottle… but the great eBay has been my friend. My thoughts and prayers are with the Markota family… what a great life Peck had surrounding himself with his passion… and all the great characters he ran across in our hobby. I have had great fun recently pouring through old issues of Bottles and Extras magazines and run across fun stories or show anecdotes that mention these pioneers in our hobby… good stuff… and so much credit is due “do’ers” like Peck and Audie Markota! Keep up the great work Jeff. Thank you Roger. Can I retire now? Although I had never personally met Peck and Audie, I too am amazed at the incredible knowledge and generosity of these fine folks. They sent me a copy of their Western Sodas book without prior payment, trusting in a fellow collector to remit payment, something unheard of today. 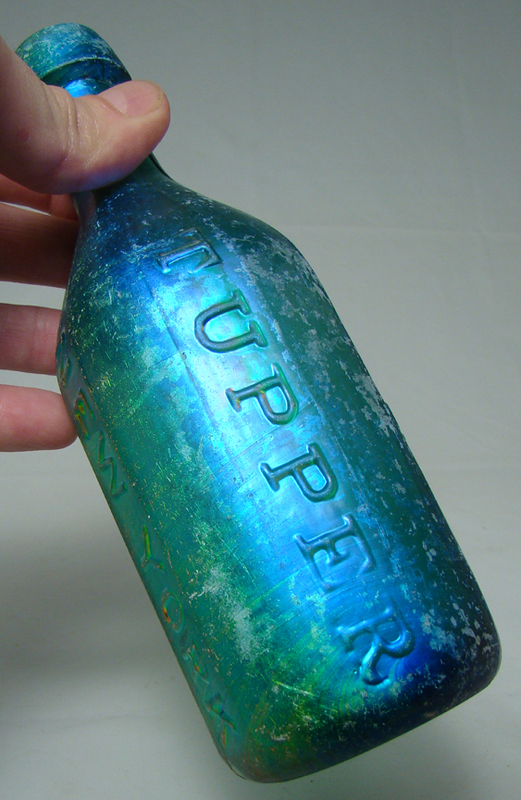 The book is proof of the vast knowledge Peck had in the field of antique bottle collecting. He and his love for the hobby will truly be missed. Hello, it looks like your site is up and coming. Well said Jeff about Mr.Markota. Nice auction keepum cummin. I’ll never forget the first time I met Peck. 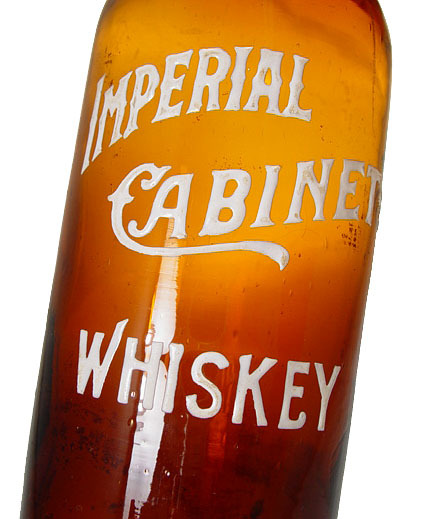 It was at the Stockton, Ca bottle show in the late 1970′s. I was only a teenager at the time. I picked up a pontilled green Cudworth S.F. soda from his table to admire. He asked me, “you like that one?”. I said, “yeah, but I’ve already spent all my money here at the show”. He then responded, “go ahead, take it, pay me at the next show”. I was stunned and elated at the same time, as I didnt have a pontilled S.F. soda in my collection. I took the bottle and assured him that I would pay him at the next show. I couldnt believe he trusted me , a total stranger, and a kid at that ! Next show, I settled up, and that was the start of a 30 + yr friendship with him and his wife. Years later they would set-up their sales table every Dec at Auburn next to mine and always bring a little Christmas decoration or gift for my kids or wife, and talk about his grandkids. Both Peck and his wife Audie were true pioneers and promoters of the hobby and always willing to assist with research, share stories, or just visit with fellow collectors. Reflecting back on the Cudworth soda, I know now how his intent was to help sustain the hobby by fostering younger collectors such as myself through his trusting gestures. I miss seeing him and talking to him at the shows. Thanks Tom, I hope more people like you, know how much he and Audie did for this hobby. It wouldn’t be the same without him. Thanks for sharing this. Very helpful! Great blog! Looking forward to receiving new posts! Jeff,Living on the East coast I never met “Peck”,but your kind words about him truly were heart felt and they made me feel as if I had known him for years.Just reading the story about the teenage kid that Peck says “pay me at the next show” tells enough about his person.You’ll all miss a great gentleman! Jeff,it’s stories like this that make this a great hobby and the friendships that are developed from it. Thanks Bill. Yes, Peck was an amazing person with an even more amazing persona. It’s something we don’t see enough these days. I thank you for your letter. Just found this, Peck was my Grandpa. I love him and miss him. I remember many of days going to bottle shows with both Grandma and Grandpa (Peck and Audie) and many monthly meetings down in Stockton and Auburn. I also attended a big show at age 10 in 1976 in St. Louis MO. Every show we went to Gramps would pull out the little notebook in his shirt pocket and write down info or questions. Always researching and always educating about bottles. I still can here the copper ” swishing” within the bottles as they were on the bottle cleaning machines in the garage. Boy did I cut a ton of copper wire for him as a kid!!! Gramp is in a plot here in Las Vegas his stone has a Blob Top next to his name. Grandma is good and living with my Mother in Las Veags. Thank you Danette. I get a lot of response to that article, it’s obvious your grandpa was looked at with great admiration. Your grandmother, Audie, is also a wonderful person and looking back at their lifetime of friendship and love, and their wonderful association with the hobby of collecting bottles, it was a lifetime filled with great joy. Your grandpa talked about you often, his pride and joy in life was his grandchildren and family. Thank you for the letter, you were a lucky person to have such a terrific grandpa. There is lot of things that can be added but point is made. Incredible! I truly like this info. It is very helpful and should get wonderful reviews, 5 out of 5 stars in my book! I expect to see more reports on this topic soon and will check again frequently for changes! This one very well made post i must say. Thank you for posting such a useful website. Your weblog happens to be not just informative but also very stimulating too. There are a limited number of people who are capable of write technical articles that creatively. we are on the lookout for information regarding this topic. We ourselves went through several websites to find knowledge with regard to this.I will keep coming back !! Thanks for the marvelous posting! I actually enjoyed reading it, you will be a great author.I will be sure to bookmark your blog and will eventually come back sometime soon. I want to encourage one to continue your great job, have a nice weekend! naturally such as your internet site however, you really need to examine a punctuation upon several of your respective blogposts. A lot of them will be rife along with transliteration issues and I in discovering the item pretty worrisome in truth then again I’ll undoubtedly come all over again once more. I feel rife with grief as I read your astonishingly poetic letter. I sure hope you don’t talk like that. Thanks for the input, I have enough copy editors as it is. I just ran straight into this site in crash, shockingly, this is the wonderful web page. The web page proprietor has done a great job of positioning it together with each other, the details is genuinely insightful new. You merely secured your guarenteed viewer. I’m still learning from you, as I’m trying to reach my goals. I definitely enjoy reading everything that is written on your website.Keep the aarticles coming. I liked it! To all those who knew my Grandparents, Peck and Audie Markota; Audie passed away on 1/4/2016. of websites for about a year and am anxious about switching to another platform. posts into it? Any help would be really appreciated!